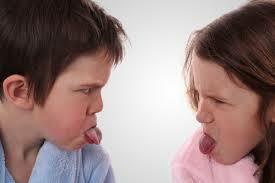 Your brother/sister can be your best friends or your worst enemies! Do you really like to prank your siblings? Yes, this is the popular time pass for brothers and sisters around the world today. Just after you annoy them, go easy on them. Yes, you should not want them hating you. Remember, pulling prank after prank is not a much matured behavior. Advice being said!! Let the annoyances begin now! But, with the appropriate tools and the ability to know the limits! Make sure that you guys end up rolling on the floor laughing at the end. Try to learn a foreign language. Start talking to your brother/sister in that language. Remember to make sure that your parents don't know the language. If they knew, you are screwed! To make it simpler, don't just learn bad words alone. Get to know curse words and mean phrases in your vocabulary. Or else, you can just say some other random phrases and make them to feel that you are insulting them. After they beg upon you, you could tell them what it actually means. You can try out dipping the ends of the pens in clear nail polish. The ink from the pens won't be able to get through and your sister/brother will not be able to write anything. He/she will sit and break the heads for what has happened to the pens. Finally, you break the silence. Make sure that you do not do this when they go for exams and end up in troubles. Get the eggs from market and cover it completely with melted chocolate. Let it to dry. Cover this with brightly colored foil, to look like a chocolate egg. Give to your brother/sister and enjoy the scene! Reverse the time in all the clocks including your brother/sister. Try change the time to a couple of hours forward. Don’t forget to set alarm. Make your sister/brother to wake up and refresh to find at the later stage that he/she could have slept for few more hours. If you have chance to prepare the fruit juice for your siblings, there comes the chance for you to prank. Don’t use real fruits here. Put any food color and make it visually appealing. Keep it in the refrigerator filling a juice carton. It will be really hilarious watching your brother/sister confused. Don’t get confused! It’s the time to confuse your sibling. Soak the hand towel in water and let it to hang on the towel holder. Your victim will really feel silly on soaking wet hands with wet towel. You can unplug the power cord of your television and shout that the system is not working. Enjoy watching this one to take long time before your siblings can figure out what is actually wrong. Or, you can take out the batteries of the remote and enjoy watching your siblings to tap on the remote in agony. Try making use of petroleum jelly or varnishes in your sister/brother door knob. You will get a chance to watch him/her swirling the knobs. Then, you go and rectify them by wearing a glove. You will become the hero of the day! One of the best things to do is to clean swipe your brother/sister’s hair conditioner and fill baby oil into it. After washing, you will find him/her shampooing again to get rid of the oil in the hair!